Some say that the Christmas holidays are the most wonderful time of year. Unfortunately, those people are wrong. 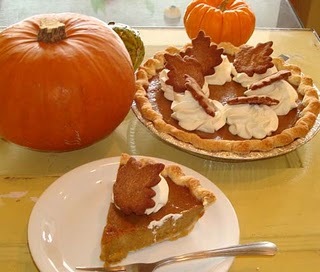 Sorry Santa, but this year it's all about October, especially with momentous events like the first pumpkin pies of the year debuting at the North Hill Bakery in Seattle's Capitol Hill neighborhood. Our Head Spy was on hand to sample some of the very first batch of pies from their ovens (it's hard being a sleuth sometimes) and reports that the owners Tracey Peterson and Margaret Rumpeltes (both veteran Seattle bakers and cooks) certainly know what they're doing: after roasting their own pumpkins to fill a buttery, flaky crust, the pies are topped with fresh whipped cream and spice cookies that act like a mini-top crust and are the perfect complement to the smooth, creamy pie filling (which had not a bit of that jello-y finish that plagues canned-filling pies). The resulting pie is so satisfying, you'll even want to eat it for breakfast (which one of the bakers, Mary, admits to doing from time to time). But be warned, these pies are a bit like the vibrant leaves of Autumn: in season for only a short time, they won't last forever. So enjoy the season while you can! Cakespy Note: No one trick-pony here, North Hill Bakery also has a full array of charming treats, fall and otherwise; check out their adorable cookies and dreamy chocolate cake! 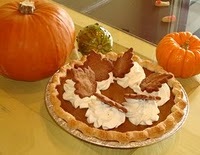 Available at the North Hill Bakery, 518 15th Ave. East (b/t E. Republican & E. Mercer Sts); for more information, visit northhillbakery.com.